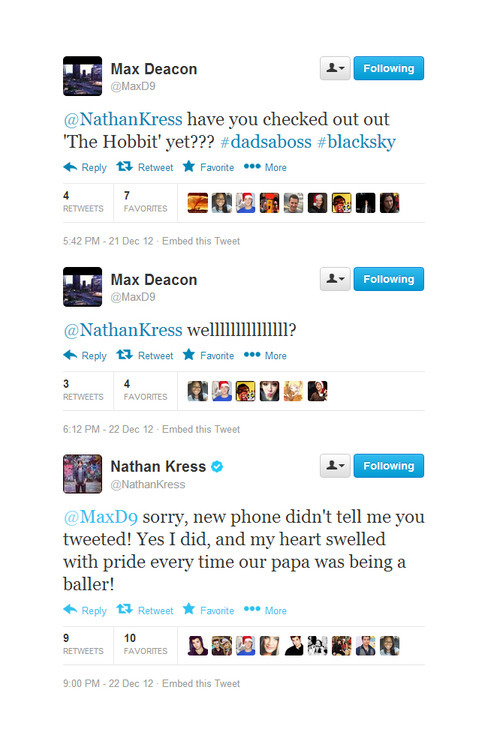 In the meantime, I found this screencap of Max Deacon and Nathan Kress gushing about Richard Armitage on Twitter. Yeah, I can handle some gushing. It’s my understanding Max will play Donnie, son of Gary Morris, and Nathan Kress will play Trey, also son of Gary Morris. That could be wrong about the names, but obviously not wrong about the papa. And for those who were trying to help me find fan sites on some of these guys, I may have found an enclave of fans under my nose. Just looked at my daughter’s Facebook page and some of her friend’s pages. Phew! note: for all of you not on Twitter, it’s a lot of fun. Don’t count on me or others to always bring you these things. Just sayin’. LOL!! I howled when I saw that conversation. Hello! Glad to “see” you. The first time someone makes a comment, it has to be approved. That’s why yours didn’t show up immediately. I’m really impressed with Nathan Kress. What an individual of integrity. The Hobbit: Unexpected Journey — The Modern Trailer What a Way To Go!